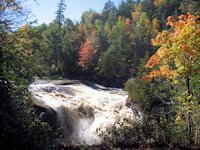 The Waterfalls on the Presque Isle River and the Lake of the Clouds Scenic Lookout area are two attractions the day visitor to the Porkies ought not to miss. The 50 unit campground at the Presque Isle unit formerly was semi-modern, providing drinking water and toilets. But the shower/washroom building had to be closed because the water quality wasn't up to snuff. So now there are only non-flush toilets but they are kept clean and functional. RV's are restricted to one end of the campground so that their generators don't bother the rest of the campers. 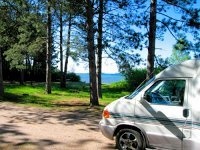 The Union Bay campground on the east end of the park has full RV facilities and showers. The Lake of the Clouds Scenic area is located at the end of Michigan Highway 107. A park pass is required to visit the area, but it is worth it + plus the pass makes you legal for all other park use during that day. 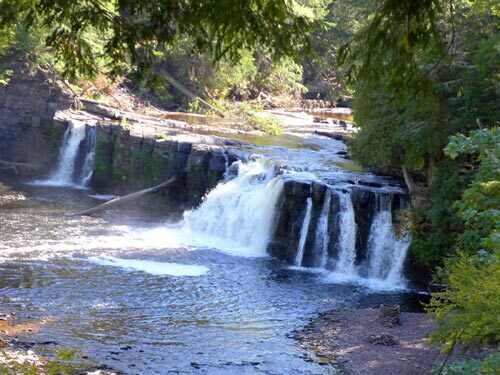 At the extreme western end of the South Boundary Road is the Presque Isle unit of Porcupine Mountain State Park, It has a rustic 50 unit campground, a picnic area and nice network of trails along the river with viewing platforms for the quite scenic waterfalls and rapids that populate the river. The river's cascades are just upstream from the suspension bridge. There are sturdy boardwalks and stairs along the river bank . 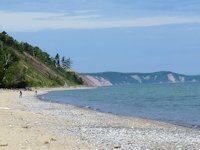 . . as well as some viewing areas that are handicapped accessible. Near right - Manido Falls. Far right. At the top of Manido Falls looking upstream towards Nawadaha Falls. The west river trail to Nawadaha Falls was closed for repairs so we couldn't hike up there this day. That's the falls upstream in the distance. 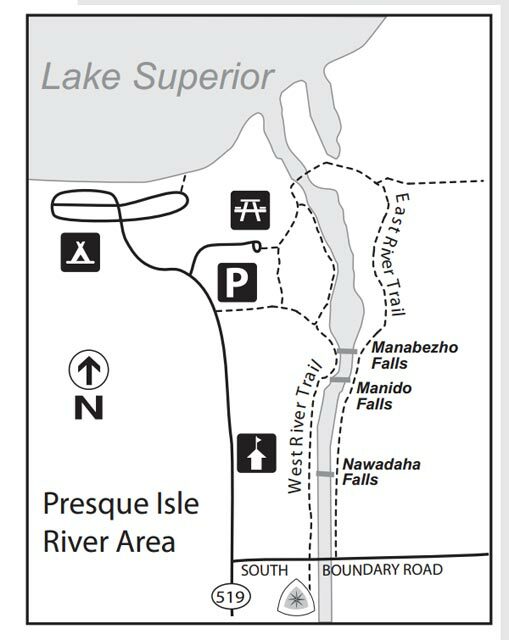 Campground Map of Presque Isle Unit and other Camping Facilities in Porcupine Mountains State Park. 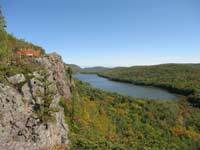 Lake of the Clouds Scenic Overlook is one of the top scenic attractions in the Upper Peninsula.